Today, Music Choice’s Head of Latin Programming Luis Rivera was recognized by GLAD Empire, a full service digital distribution and artist development company, for his continued support of Latin independent artists. 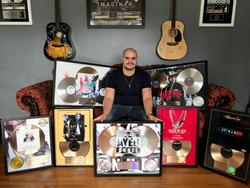 He was presented seven plaques on behalf of the network in commemoration of Gold and Platinum certified singles for J Alvarez “Rico Suave” and “Haters”; Bryant Myers feat. Bad Bunny “Un Ratito Mas”; Bryant Myers feat. Noriel “Vente Pa’ Ca”; Tito el Bambino “Ay Mami”; Pusho feat. Ozuna “Te Fuiste” and DJ Nelson & Anuel AA “Ayer”. This recognition is especially of note since Music Choice has championed the new sub-genre of Latin Trap that has exploded on the music scene earlier this year. “Our entire operation is based on helping independent music thrive with the correct tools. Artists need to know that sometimes remaining independent is the best option and that platforms such as Music Choice that reach millions of people are vital to their success. I met Luis Rivera in Miami a couple of years ago and since then, we have worked together on thousands of songs and videos to introduce new talent and highlight the top artists within our roster. For his consistent support over the years, it was only fair to make him part of all of these recognitions, so that he knows we truly appreciate it,” said Camille Soto, owner of GLAD Empire.